As part of our work with clients, we often encourage them to ‘notice what you are noticing’ about yourself and others and we have conversations about this. 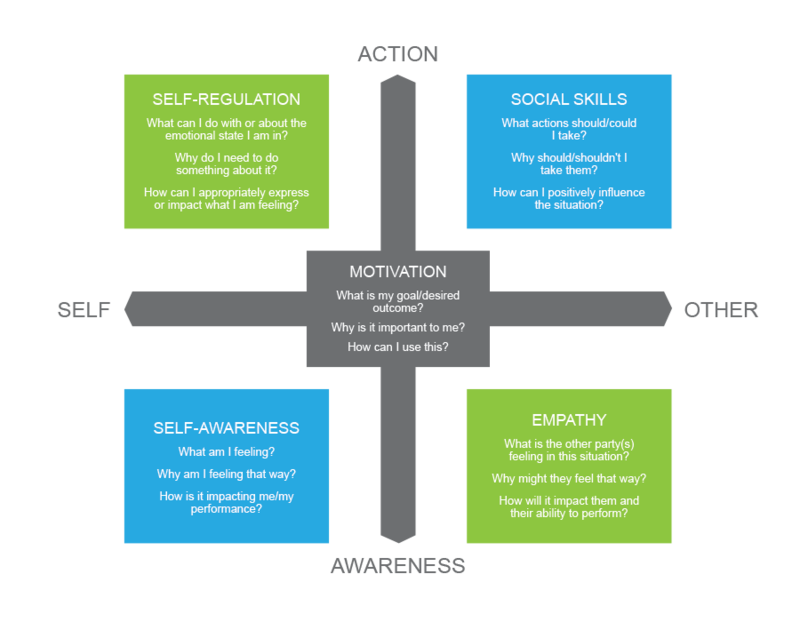 This encourages the development of self-awareness (what am I feeling about what I am noticing and why) and leads nicely into self-regulation (what can I do with or about the emotional state I am in). When you notice what your noticing about others you are also working on your social skills (what actions should/could I take) and the ability to have empathy (what is the other party(s) feeling in this situation). The reason for this conversation is to establish the essence of emotional intelligence in clients everyday lives based on the Daniel Goleman Model. According to Goleman, emotional intelligence is the ability to sense, understand and effectively apply the power and acumen of emotions to facilitate high levels of collaboration and productivity. This is a complex area that is often poorly explained and understood, so bringing it to life in daily activities helps. A simple explanation was presented recently by TTI Success insights as part of their DISC, Workplace Motivators and Emotional Quotient Accreditation programme. See the diagram below. The workplace is where professionals spend most of their time, however, both at work and at home, we are exposed to many stimuli each day that are positive, negative or neutral. These stimuli produce emotional responses in our body that colour and distort our thoughts, feelings and actions. Given that performance at work is largely judged on behavioural observations, appropriately managing emotions becomes all the more important as they have a strong influence on our behaviour. Neuropsychiatrists through virtual reality and body mapping have shown the emotional response precedes our rational response, so emotions are influencing every decision that we make. If we are able to recognise, manage and appropriately leverage emotions in ourselves and others, then we will be able to perform at a higher level and make better decisions. Developing our emotional intelligence is a journey not an event. Research has shown a correlation between emotional intelligence and age. As we get older, we become more adept at managing our own emotions and emotions of those around us. The more we reflect on our emotional states, their triggers, magnifiers and diluters, the better equipped we will be to apply our emotions intelligently. Each year we experience around 80 events of great intensity that have the capacity to alter our patterns of thought, feeling and behaviour. The average person will properly reflect on and process three of these events per year. The more learning opportunities or experiences a person processes, the more their emotional intelligence will develop. It can also be developed by making people aware of “what it is” and “why it is” important and through developing strategies to deal with the emotions as they arise. Hence, when you ‘notice what you are noticing’ and think about how you are feeling and why and what you can do about it, you are developing your emotional intelligence.